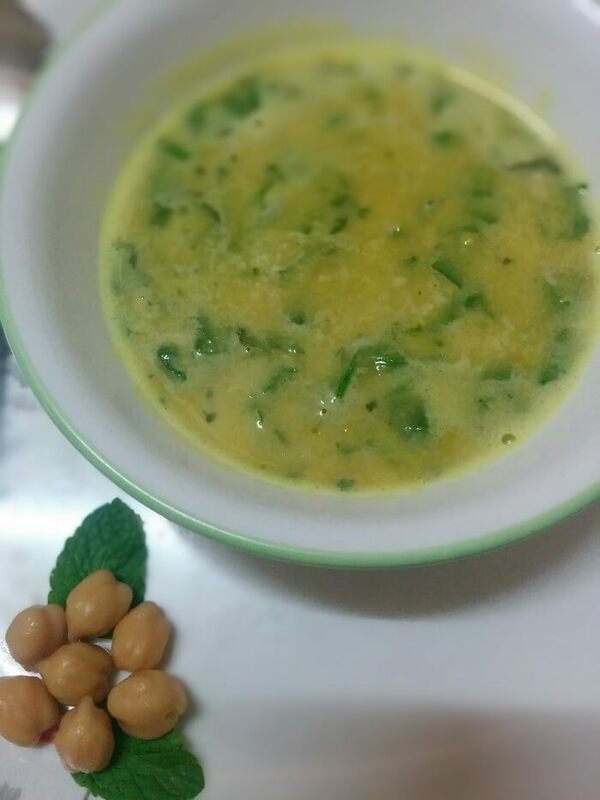 Here’s a yummy protein packed chickpea and spinach soup recipe for babies and kids. India is the highest producer of chickpeas in the world. In Indian cuisine, chickpeas or kabuli chana is often used to make the traditional spicy chole. But do you know we can make a yummy and healthy soup also using them? Let’s make a simple and healthy recipe using chickpeas and spinach today. It is inspired by Moroccan style chickpea soup and customized to suit the young tummies and taste buds. You can also refer to the vegetable soup recipe with spinach and sprouts for babies. Let us talk about the main ingredients for the soup now. Chickpeas or bengal gram are protein –packed, inexpensive and are considered as great foods for babies and growing children. They also reduce the risk of anemia, help in bone growth and supply anti-oxidants. You can also read about the benefits of chickpeas along with a snack recipe for kids. We will also include spinach in this soup which gives a wonderful color and texture to the soup along with the nutrition. According to the research, the flavonoids present in the spinach function as anti-inflammatory and anti-cancer agents. It is also an excellent source of vitamin K, Vitamin C, vitamin A and folic acid. It is also regarded as a plant with extraordinary abilities to restore the energy and enhance food quality. Do you remember Popeye the sailor man who would use spinach cans when in trouble? Once spinach is consumed, his biceps would bulge and he would win over his enemies. This soup can be served to babies above 10 months. Generally chickpeas can be introduced to babies once they are 8-9 months old. Like many other legumes and pulses, chickpeas have a tendency to cause gas. But do not stop giving them to babies for this reason as over a period of time, most tummies adjust to them. We can also try to minimize the gaseous impact using some spices like ajwain (carom seeds), jeera (cumin) and adrak (ginger)) as we would be doing in this recipe. However if your baby is extremely prone to gas problems, it would be better to start this soup a month or so later in his diet. You can also refer to the effective home remedies for gas in babies and kids. I am using the boiled chickpeas for this recipe. To get the chickpeas ready for the soup, wash and soak the dried chickpeas in large bowl (as they tend to expand), covering completely with water. Allow to soak overnight. Drain the excess water after pre-soak and wash them again using fresh water. Cook the chickpea (this step as per a few experts reduces the gaseousness of chickpeas). I use pressure cooker to cook them and give at least 10 to 15 minutes on low pressure with a few whistles. Cook chickpeas as per the instructions give above. Blend the cooked chickpeas and mint with 1 cup of water. Heat oil in a kadai. Add grated ginger and chopped spinach. Add turmeric powder, ajwain powder and wait till spinach is cooked. Add the chickpeas puree to this. Add lemon juice and salt. Once it boils, switch off the flame. Green chilies/ black pepper can be added to make it spicy. For older kids, you can also serve the soup with bread, paratha or chapatti. In case your baby does not like chopped spinach, you can replace it with blanched spinach puree. Puree the chickpeas and mint with 1 cup of water using mixer. /blender. In a thick bottom pot/ kadai, heat the oil / butter and add the grated ginger & finely chopped spinach. Let it cook for a minute on low flame. Add in the ajwain powder, turmeric and continue to cook for 1-2 minutes more (till the spinach is cooked). Let us add the chickpeas puree to the spinach mix. Add Salt and lemon juice as per your preference & let it boil for 2-3 more minutes. You can also adjust the consistency at this point by adding more water if needed. Protein packed Chickpeas soup is ready to be served. You can also refer to the carrot tomato soup, sweet corn soup and 7 healthy soup recipes for your babies. Hope this simple recipe will add some more variety in your regular menu and your little munchkin will like it too. Do you have any other version for chickpea and spinach soup recipe for babies? If yes, please share with me in the comments section. Next Article How To Teach Fruits and Colors to Kindergarten Kids?